By now, audiences eager to see “Interstellar,” Christopher Nolan’s hotly anticipated space epic starring Matthew McConaughey, Jessica Chastain and Anne Hathaway, have heard the word on the movie, which has received mixed-to-positive reviews. The unanswered question is whether they’ll hear a word in the movie. Movies are frequently louder these days, crowded by frenzied film scores from composers seemingly emulating John Williams' work in the Star Wars franchise. The films are also crowded by frenzied action and often, cartoon-like character development. I don't know if this is true of Nolan's film, but I do think that Hollywood is in defensive mode, seeing movie audiences continue to shrink as consumers increasingly opt for pulling up the drawbridges around their houses to for in-home entertainments, serving up loud, crowded stews that are more like video games or roller coaster rides than movies. It's as though Hollywood is screaming, "Hey, look at us! There's nothing to see, but we will put you through a buzz saw of sensory overload!" Interstellar may be a great movie. But I think Hornaday and others raise a good point. I love cranked up tunes at rock and hip hop concerts and in my car. Sometimes though, I think, all that "loud," along with the visual pyrotechnics, take away from films. How Far Has Big 10 Football Fallen? I'm rooting for my Buckeyes. But I don't see them beating Michigan State. Two reasons: offense and defense. This was when McCartney's voice was extraordinary. Check out the "shag" haircuts. What a great love song. My favorite rapper these days, Lecrae, is on the bill for a Christmas show in Brooklyn that includes Run DMC and LL Cool J. If you're going to be NYC on December 19, hope you check it out! And by the way, Lecrae's latest LP came out the same day as U2's Songs of Innocence. The rapper's release is great too. Lecrae is Christian. He also talks things other than his faith in his music, including wrestling with materialism and justice for, in Jesus' phrase, "the least of these." His music is infected with Christian sensibilities, to be sure. But he is a great artist, a fact acknowledged by Non-Christian and Christian followers of rap and hip hop music. ...will be better than the best that we experience or can imagine in this life. That's a comforting, empowering thought. But when I was an atheist, I thought that the Christians' hope of resurrection life with God beyond the grave meant that they were anesthetized while living in this life--disengaged, heedless of the injustices faced by others, fatalistic. That's exactly what Karl Marx, another atheist and writer of The Communist Manifesto, thought. He famously wrote, "Religion [by which he meant the Christian faith into which he had been baptized and which prevailed in the Europe of his day] is the opiate of the people." He got it precisely wrong. There undoubtedly are Christians so focused on heaven that the idea of loving God and loving neighbor, the very things the crucified and risen Jesus set us free to do, is far from their minds and agendas. For Christians like these, Jesus is a private fix, a ticket to eternity. But for those who seek to take Jesus and His preeminence over their whole lives, the certainty of eternity in God's perfect kingdom for all who believe in Christ, is the freedom to live, to love the unlovable, to speak up for the powerless, to pursue the promise of our lives on earth, to share the gifts of God granted to us with others. "I'll only be home for dinner three times a year"
This puts me in mind of Hebrews 10:24-25: "...let us consider how we may spur one another on toward love and good deeds, not giving up meeting together, as some are in the habit of doing, but encouraging one another—and all the more as you see the Day [of Christ's return] approaching." [God responds to]...prayers...offered by those who are thoroughly convicted of their sin and shame, but, at the same time, are convinced of God’s grace that goes out to undeserving sinners. It's when we're broken by the reality of our sin and the depths of our need for God in desperate circumstances--even in the smallest of circumstances, that we learn to truly pray and in dependence on the charity (the grace) and love of God. Verses like that and, most certainly, the death and resurrection of God in the flesh, Jesus, should give us confidence that, in a memorable phrase from an old Curtis Mayfield song, there's no such thing as a "hopeless sinner." God will not tolerate sin in His presence. We cannot enter eternity covered and filled with them. But we can be made clean by the God Who died for our sins on a cross and rose from death to open the way to reconciliation and peace with God. You may feel "less than the least," but through Christ, you can turn to God in repentance and have your life made new. That's good news! "How to Make a Perfect Omelet"
From The Blue Apron, via The Art of Manliness blog. This isn't how I do my omelets. I prep the mushrooms and asparagus, for example, before I fix the omelet. But I dump it, along with some peppers, spinach, and tomatoes in after I pour the egg whites in. (I use egg whites only because of my heart situation.) I may have to try this technique...sans flipping it with the pan because I am not a seasoned chef. Love this song! Only one hero...and He's not one of us. This is a demo that Mullins made shortly before his tragic death. Love this song. The BBC is launching a new music channel and to help start things off, they've produced an epic music video, with multiple artists from various musical genres joining Brian Wilson on God Only Knows. That tune, composed by Wilson, was a great hit for his band, the Beach Boys. The whole video is fun and the sentiments of the song touch a deep chord. After all, isn't this exactly how people feel? They can't imagine living without the people who love them and who they love. This post acts as a program, so you know who all the players are. This little film gives a behind-the-scenes look at the making of the music and the video. 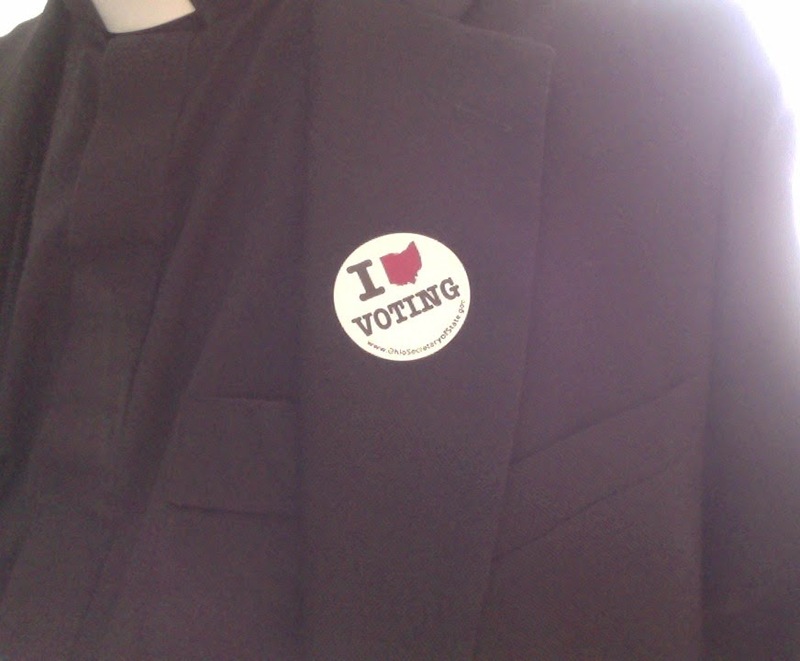 If you haven't voted yet and are registered, I hope that you'll take the time to vote today. In case you're uncertain about where your assigned polling station is or about the candidates and issues in your community, this site can help you. The Bible is clear that Christians are to be good citizens and honor those who are in authority. So, for us anyway, voting is more than a right, it's a responsibility...to God, to neighbor, to country, and to the world. An infectious dance tune, a fun expression of faith. Shout to the North by Delirious? I always loved hearing--and singing--this song. Impressive live, acoustic version of this song from U2's latest LP. I've never seen The Lake House, though I've been told it's good. This scene, using Paul McCartney's This Never Happened Before for the point at which the lead characters realize their love for one another other, gives me the idea my friend is probably right. I'm a sucker for romantic comedies. Here. The items in the grey box at the bottom of the page are better than the article itself. Check it out. "I believe that we will..."
"I believe that we will win." By now, many will have heard that simple, infectious chant at sporting events. Evidently, it was taken up by fans of the United States soccer team during its recent World Cup matches. Youtube shows a lot of college basketball and football fans using it, especially out in Utah, as early as 2010. But wherever the chant came from, it's cool, especially when it's not part of the official program, simply arising spontaneously from the stands. The whole phenomenon set me to thinking, though. Every Sunday at our church and, I know, at most churches, there's a time set aside for people to confess their belief in the triune God--Father, Son, and Holy Spirit. Some do it with altar calls. My tradition does it with the historic creeds of the Church--the Apostles' Creed, the Nicene Creed, and sometimes the Athanasian Creed. But what if, at the point in our services usually designated for us to confess our faith, someone took up a simple chant, believers bobbing up and down in celebration and belief? It might be kind of cool. Can you hear it? Go ahead, you know you're chanting it silently at your computer right now. Stand up! Do a little aerobic praise. Bob up and down and chant away what you believe! Feel free to post videos of you, your family, your youth group, your basketball team, or whatever on Facebook or Youtube. A lot of people might be encouraged by the sight of Christians showing as much enthusiasm in cheering for God as all of us often do at ball games. We sang this worship song during the 2013 mission trip I was blessed to take with the youth of Saint Matthew Lutheran Church of Logan, Ohio. It was the first time I remember singing it. I love how the song expresses an "in spite of" faith. In the New Testament portion of the Bible, Paul talks about praising God not for all circumstances, but in all circumstances. Even in the midst of the junk and the heartache that can come to us, God has still conquered sin and death, He still loves us, He still stands by us in all things, He still receives the repentant. So, no matter what my circumstances or how I feel, I will bless the Name of the God revealed in Jesus. Big Question: What is a Saint? Today is All Saints’ Sunday. But what exactly is a saint? This isn’t just some academic question. The answer has eternal consequences for all of us here this morning, in fact for everyone in the world. To find out what a saint is, we’ll turn today to the New Testament book of Revelation 7:9-17, our first lesson. Revelation, you know, is based on a series of visions given to the apostle John about sixty years after Jesus’ resurrection. Beginning at chapter 6, John sees Jesus, the second Person of the one God, open the first six of seven seals. With the opening of each seal, John sees this creation moving closer to its inevitable end. He also sees glimmers of the new creation that the risen and ascended Jesus will finally and fully usher in when He returns to claim His kingdom from our enemies, sin, death, and the devil. Jesus’ return will bring celebration and relief to all who have turned from sin and who have believed in Christ. Then the numbers of those sealed for salvation are counted out. The total comes to 144,000. Don’t be worried by this number, though! The Bible is not saying that a measly 144,000 people out of all human history will be part of God’s eternal kingdom! The number 144 is derived from multiplying the 12 tribes of Israel times the 12 apostles Jesus chose to lead the post-resurrection church. For John, it would have been a number implying perfection and completeness. And, tacking three zeroes onto the back of 144, making it 144,000, would be a bit like one of us talking about “a gazillion” people showing up for Black Friday sales at Macy’s or Target. I can hardly read those words without getting chills! This is no little crowd of 144,000! It’s a multitude! Turn to page 9 in one of the sanctuary Bibles and read what God did in Genesis 15:5 to help Abram believe: “[God took Abram] outside and said, ‘Look up at the sky and count the stars—if indeed you can count them.’ Then he said to him, ‘So shall your offspring be.’” "Abram," God was saying, "I Who made more stars than any mortal could ever count is capable of keeping My promise to you. I will give you a son. And not only that, your descendants will dwarf the numbers of stars you see in the sky right now." Abram--Abraham--was saved by grace through faith in the God of promise. That God has since revealed Himself definitively to all the world in the crucified and risen Jesus. Jesus is the God Who gave Abraham that promise four millennia ago. And He is the God Who promises that everyone who turns from sin and believes in Him becomes a descendant of Abraham. They are saints. God has always wanted to rescue His fallen children from sin and death and to give them life. Saints are those who trust God to give them the free gifts that come to all who turn from sin and believe in Jesus: gifts like forgiveness of sin, eternal life, the power to live each day for His purposes. But if sainthood is a free gift from God, we must not think for a moment that sainthood is easy. We see this from just four words in our lesson from Revelation today. The first two of those words appear at the beginning of verse 9: “After this.” After what, exactly? John saw the multitude of saints after an event that’s mentioned in verse 14. Despite the propaganda who misconstrue Revelation, "the great tribulation" does not refer to some endtime cataclysm. It’s the common experience through which every believer in Jesus goes, in big ways and small. We live in a world filled with beauty and wonder. But with its beauty and wonder marred by human sin, death, and even the suffering of the saints, this world can, at its best, still only give us nothing more than a glimmer of the beauty and the wonder—the perfection—that await all who persevere in following Jesus as their only God and King to the end. After completing life in this world, the saints who have kept on trusting Jesus, will be met by the Savior, Who will make them clean forever, Who will dry their tears, Who will feed their hunger and quench their thirst for the righteous life only He can give, and lead them into the new creation for which each of us were made. For now, we live in an in-between time in which, as Paul writes Romans 8, both we and the whole of creation wait with eager longing for Christ to reveal Himself and His children. Here's a fact you may not have noticed: Life is hard. Even in the best of times, life can be a struggle. And sometimes, our struggles are made even harder because we believe in Jesus Christ. How much easier the lives of so many here today might have been had they, when confronted by evil and false teaching in another church a few years ago, stood with the shifting mores of the world instead of with the truth and grace of God revealed in His Word? And I am personally convinced, by my experience of moving from being an atheist who rarely had a troubled conscience to being a follower of Jesus Who wants to please the God Who loved me all the way to the cross, that the devil couldn’t care less about tempting or testing those who live their lives without faith in Christ or fear and respect for God. Instead, the devil tests, tempts, and tries the saints. And every believer in Christ will, eventually, bear the scars—physical, emotional, or relational—that come to those who put following Jesus first in their lives. Mark it well: Follow Christ and He will most certainly thwart you in some of your most heartfelt desires because He’s less interested in giving you momentary happiness than He is in fitting and forging you and your character for eternal life with Him. Our own personal “great ordeals” may include persecution, chronic or fatal illness, disagreements over priorities with those we love or with whom we work, or the conflicts that happen within us when a sin tantalizes us and we know that we must choose God’s way and not our own. A member of our parish in Cincinnati, Karen, spoke for millions of Christians after she’d gotten yet another poor report on the cancers that would eventually take her life. We were sitting alone when she remarked, “I just can’t seem to catch a break.” There was nothing I could say to make her situation understandable. I couldn’t understand it. Yet, despite her disappointment and mystification, Karen, an environmental scientist who was exceedingly intelligent, persisted in her faith, confident that while the many prayers for her healing weren’t being answered in this life, she would, because of her faith in Christ, experience the ultimate healing when, in eternity, she would be sheltered forever from all disappointment and pain by God the Father, Son, and Holy Spirit, along with all the saints who, like her, put their trust in Jesus. Saints are people who trust their whole lives to Jesus. Sometimes haltingly. Always imperfectly. At times even resentfully. But no matter how their hearts may wander, they always know to come back to Christ. In the meantime, dear saints of God, do not be afraid! Know His love and power for you even in the midst of life’s greatest tribulations and know for a fact that, if you remain steadfast in following Jesus, like saints before us, Jesus will welcome you in His heavenly kingdom. If we remain faithful to Christ, you and I will one day join our fellow saints, along with God’s messengers, the angels, in singing and savoring the glories of our loving God and all who have persistently, perseveringly, enduringly followed their Savior in this world will hear the Lord say to them in the next world, “Well done, good and faithful servant!” Amen! Mark D. Roberts blogs about a study by a Harvard psychologist and a 2012 BBC TV special which, decades later, attempted to replicate. Roberts cites a lengthy and interesting article from The New York Times. In the New Hampshire house, the men were surrounded by the music, television, magazines, books, and movies that would have been current twenty-five years earlier, in 1959, when they would have been younger and healthier. On arrival, they were told that no one would take their luggage to their rooms. They would have to do so, even, as the article has it, if that meant they took up articles of clothing one piece at a time. At the end of their stay, the men were tested. On several measures, they outperformed a control group that came earlier to the monastery but didn’t imagine themselves back into the skin of their younger selves, though they were encouraged to reminisce. They were suppler, showed greater manual dexterity and sat taller — just as Langer had guessed. Perhaps most improbable, their sight improved. Independent judges said they looked younger. The experimental subjects, Langer told me, had “put their mind in an earlier time,” and their bodies went along for the ride. The results were, as Langer says, almost too good to be true. She shied away from writing much about it in scholarly journals, fearing her colleagues would automatically dismiss the whole thing as too fanciful. As I say, in 2012, the BBC produced a short series in which the producers essentially replicated Langer's study with a group of older British celebrities, achieving similar results. All of this is highly suggestive, of course. How much of the aging process is about simply disengaging from life, exchanging the joys and challenges of the daily struggle for the alluring and often deadening perks of senior citizen status? Frankly, as a pastor, I have seen people age well and others do so waving a white flag of surrender and entitlement...and early graves. Those who desire to contribute have seem to be the ones who remain young and vibrant, while their peers seem to age overnight. So, I think there's a lot to this whole mind-body connection. But there is something that disturbs me about Langer's approach. She achieved positive results in the health of those who disengaged from the world and immersed themselves in one that no longer existed. Is nostalgia the key to making people experience sustained good health? I hope not, because nostalgia is bad history, for one thing, and, more importantly, it hardly empowers seniors to make the kinds of contributions that are only possible, I think, for those who live fully in the only moments we can inhabit at any given time, the moments we call now. But knowing when to take our hands off and let God work can make us feel vulnerable. Unless, that is, we believe that God is indeed “our refuge and strength, a very present help in trouble” (v.1) and that “the Lord of hosts is with us; the God of Jacob is our refuge” (v.7). In the midst of trouble, we can rest in God’s care. I'm one who finds it hard to let go. It's important for me to remember to put things in God's hands.